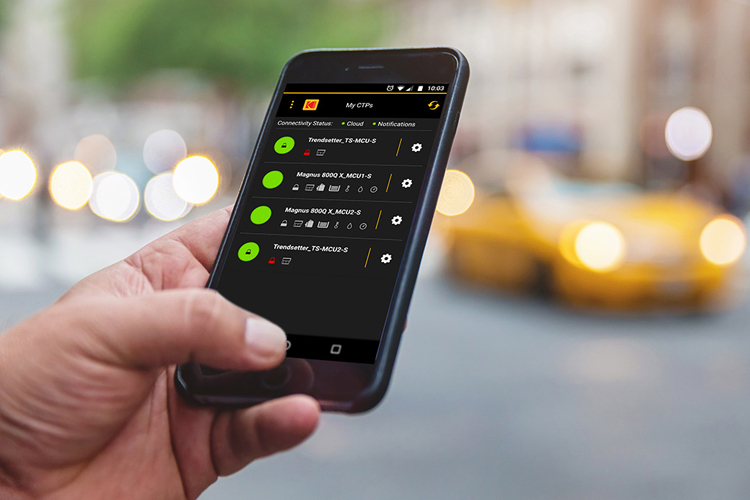 In late 2018, Kodak introduced a new innovation for use with our CTP devices: the KODAK CTP Mobile Control App. The app allows users to monitor up to 10 CTP devices on their mobile phone. It has an easy-to-use interface that delivers flexible, proactive control for maximum uptime and productivity. As we enter 2019 and usage of the app is gaining traction, feedback from Kodak customers using it has been glowing. Santiago Villasenor, Prepress Manager at Shweiki Media in San Antonio, Texas, has been thrilled with the app’s impact on his day-to-day operations. “It's really a wonderful tool,” said Villasenor. “It allows me to monitor our operations on the fly. Often, I will be out to dinner with my wife, and I can just quickly glance at the app and see how everything is going during the night shift. It really gives me a sense of control wherever I am. If I see an error arise, I can just hit a button and stop the machine and quickly correct the problem. That's very powerful for us to have this level of insight and transparency into our operations right in the palm of our hands,” he added. Klaus Gasser, Plate Operator at Kodak customer Jordi AG in Switzerland, wholeheartedly agrees. The CTP Mobile Control App is another example of our continuing focus on Taking Print Further in 2019 and beyond. The CTP Mobile Control App is available for free with a Kodak Service Plan.